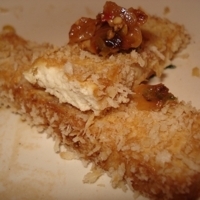 Easy, low-fat, delicious, crunchy tofu straight from your oven! I made this last night. My first time making Tofu, it was much easier to work with than I thought! I used a Teriaki marinade instead of the BBQ. So the flavor was a bit off, I should have used what was in your recipe :) Other than that, I loved the Panko.. and it was enjoyable to make, and tasty! Thanks for sharing! I like this one Quite easy and tasty.